The spring Mahi-Mahi run is officially underway! 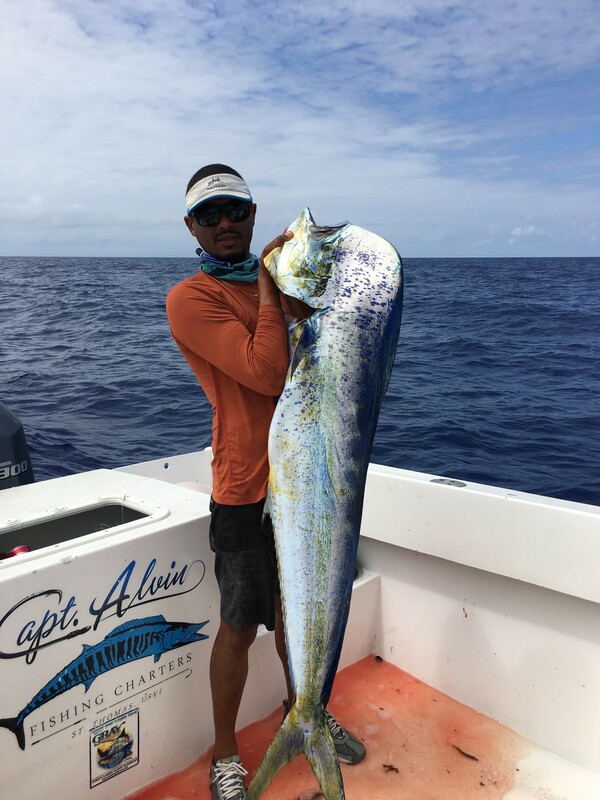 Schools of Mahi are showing up in solid numbers to the south and north of the island, with the biggest fish migrating between St. Thomas and St. Croix. Even a few out of season Wahoo are mixed in, mostly in the 20-30lb class, adding the excitement of a multi-species offshore day. 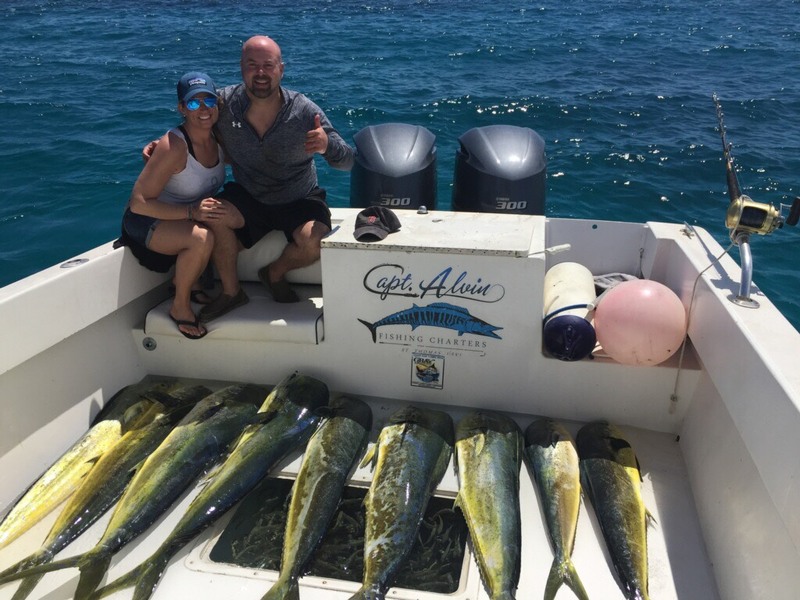 Some of our most recent offshore trips in early April found multiple Mahi in the 30-40lb class with consistent bites in both the morning and later afternoon hours. All has been relatively quiet on the Yellowfin front, we’ve heard a few fish being caught in the past two weeks upto the North but we haven’t seen the typical winter/springtime action. This bite is bound to pick up soon and we expect to see them start to show along the North Drop by the end of this month with May and June being the best bet for big Yellowfin Tuna. But the most exciting news of 2017 so far is a repeat Best Boat award in this year’s Dolphin Derby hosted by the U.S. Virgin Islands Game Fishing Club. The Capt. Alvin tournament crew weighed in a 31.5lb Mahi that was just 2lbs shy of the first place winning fish, but an overall catch of 10 Mahi-Mahi totaling 180lbs earned Best Boat award for the 4th time in the past 5 tournaments held. 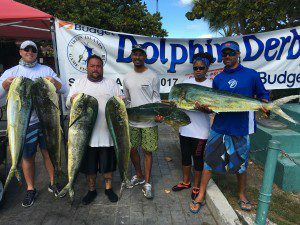 This is arguably one of the best tournaments of the year, with a competitive field of 35 boats and featuring some of the best captains and crew in the USVI. The Inshore scene has been nothing short of fantastic since this winter. 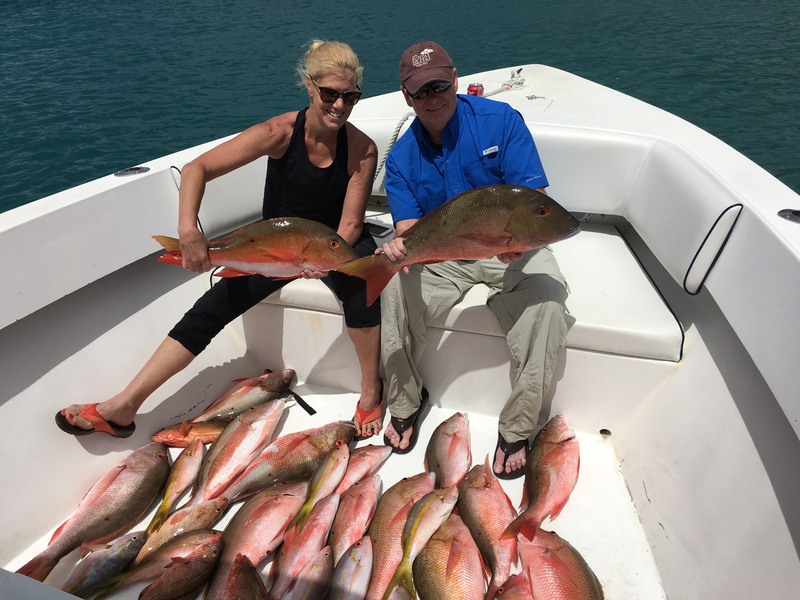 We’ve been blessed with a continued influx of fresh bait since January which has kept our local reefs and wrecks very active along the St. Thomas coastline. Yellowtail Snapper, Mutton Snapper, Kingfish, Pompano, Houndfish, Rainbow Runners and Blackfin Tunas have all been in the day’s catch. The Yellowtail and Mutton Snapper bite in 2017 has been the best we’ve seen in 5 years. We’re very excited for the spring and summer season and hope you’ll get out on the water with us if you’re planning a visit to St. Thomas or St. John!